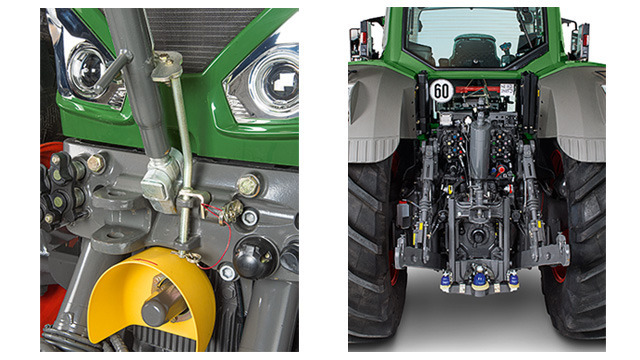 The Fendt 800 Vario offers more connections than any other tractor in its power class: six electrohydraulic double-acting valves at the rear and two in the front, power beyond, ISOBUS connection and many more. The 800 Vario has more than 24 interfaces, which are practically placed in the front and at the rear. That guarantees versatile operations and trouble-free connection of all implements – for effective teamwork between the tractor and implement. The electrohydraulic rear power lift, which has a maximum lift capacity of 11,110 daN, guarantees that even heavy rear-mounted implements for this power class can be lifted to the fullest height without trouble. A maximum lift capacity of up to 5,030 daN at the front permits the use of heavy front-mounted implements. The newly designed, cast front linkage is integrated in the structure of the tractor so that the coupling points are close to the vehicle. Moreover, the leakage oil container lies protected in the rear linkage. The comfort front linkage has optional load relief control, which can be adjusted using the Varioterminal. It uses the double-acting front linkage valve to lower the implement and transfers the weight of the implement to the front axle. This is a particular advantage when operating a snow plough or a front mower in grassland operations, since implement guidance can be quickly adjusted to uneven surfaces. Relief springs for the mower are no longer required. With its load-sensing technology, the 800 Vario is well-equipped for demanding operations. Depending on the area of application, you can equip the 800 Vario with a load-sensing pump with a delivery capacity of 110, 152 or 205 litres per minute. The pilot pressure is also generated by this axial piston pump. The PTOs can be easily controlled via the multi-function armrest. External controls are also available at the rear. The PTO speeds (540E/1000 or 1000/1000E) at the rear enable work at a lower engine speed, which means lower fuel consumption. The front PTO (1000 rpm) permits operation with a broad range of implements at the front of the tractor. Whether you use your 800 Vario primarily for field work, haulage or special operations – you will profit from its low unladen weight in any case. On the one hand, you have higher payload reserves and, on the other hand, you don’t need to transport unnecessary weight. A tailor-made ballast concept is ideal for heavy draft work. Fendt offers various hitch systems, which means high flexibility to meet all demands. The right hitch system is available to match the requirements. a 60:40 weight distribution (front axle : rear axle). When the tractor is then used for draft work, and subject to the corresponding torque and forces, the values are shifted and you have “dynamic ballasting” of 40:60 (front axle : rear axle) which is the optimal range for draft work.